This post is Part 3 of my series on Drought in California. In Drought and the California Climate, published 2 weeks ago, I reviewed the drought California is experiencing, the state’s historical climate, and projections for the state’s future climate. I discovered that drought is expected to become the “new normal” for the state. In The Status of California’s Current Water Resources, published last week, I surveyed California’s current water resources, discovering that California is already experiencing deficits in both groundwater and surface water. Both groundwater and surface water supplies are being depleted. Unless changes are made, the depletion is projected to continue. This post attempts to construct a summary total of California’s overall water deficit. The estimate is going to be a very rough, “back-of-the-envelope” exercise, that relies on a number of assumptions that may, or may not, be correct. Nevertheless, such an estimate is needed in order to evaluate potential measures to procure additional water supplies and to conserve existing ones. There are surprisingly few published estimates out there. They are uneven in what they include and omit. Indeed, much of the data and the analysis used for this series have problems and limitations. You can read about them in the introduction to the series. As noted in the previous post, the total water supply for California has been estimated for wet, average, and dry years. Because climate change is expected to cause drought to be the “new normal” in California, the supply during dry years is the one that should be of most interest to us. In addition, either the total supply or the dedicated supply can be estimated. The total supply is an estimate of every drop of water that falls on the state as precipitation, every drop that is imported in aqueducts from other states, every drop that is desalinated, and every drop that is pumped out of the ground. The dedicated supply is the portion available for human consumption. The not-dedicated water is not surplus; it recharges aquifers, and supports the plants, animals, and fish that live in California. Thus, it is not an untapped water supply available for humans to grab. The dedicated supply is the estimate that is relevant to these calculations. As noted in the previous post, the dedicated supply of water during a dry year is 65.1 million acre-feet. (California Department of Water Resources (b)). Table 3: California Dedicated Water Supply. Source: California Department of Water Resources (b). Table 3 at right shows how the dedicated water supply is used in wet, average, and dry years. 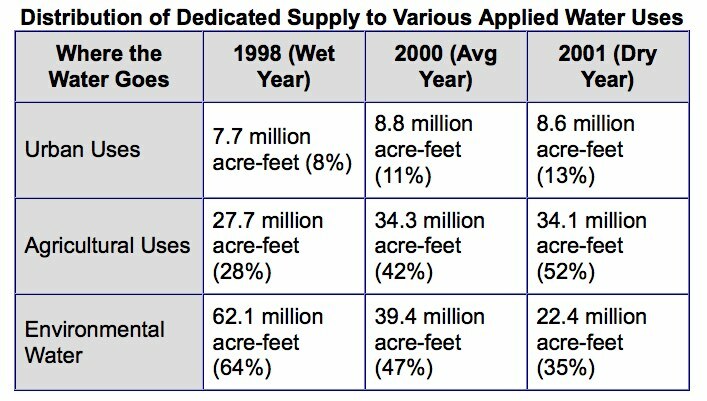 The table shows that in dry years, the amount of water distributed by the California State Water Project to agriculture and to urban uses actually increases. But the amount distributed to environmental uses decreases by almost 1/3. This is not difficult to understand: they close the sluice gates. More water is held in the reservoirs and diverted into the aqueducts, less flows into the rivers. In 2015 the California snowpack was only 5% of its historical average. If this were to become the normal occurrence, it would represent an immediate and existential threat to the state. Not only would runoff into the streams that charge California’s man-made reservoirs be reduced, but water seeping into the ground to recharge the aquifers would, also. However, the 2015 snowpack may be a temporary extreme, and it may be better to accept the National Climate Assessment’s projection of an average 40% decline in the water content of the snowpack (discussed in Part 1). That would amount to 11.6 million acre-feet. It is difficult to know how to combine this information into an overall estimate of California’s looming water shortage. It seems that only the National Climate Assessment anticipates a decline in water supply based on the decline in the snowpack, and none of the estimates discuss the need to reverse the already-occurring depletion of essential reservoirs. Combined, they sum to a total water deficit of 25.1 million acre-feet, about 39% of California’s dedicated water supply in dry years. Thus, I estimate that to remove its future water deficit, California will need to increase supply and/or reduce demand by more than 1/3. This estimate is much larger than currently published estimates. The primary reason is that I have included both population growth and the projected effects of climate change. If population growth and climate change trends were to change, it would impact the estimate. In addition, though I remarked on the limitations of this analysis at the beginning, I feel I should restate that the analysis relies on a number of assumptions that may or may not be correct, and on data that is far from perfect. California can contribute to minimizing the impacts of climate change, but no single state is in control of climate change. California will have to adjust. The estimate constructed above provides one perspective on just how much adjusting they will have to do. In coming posts, I will explore potential strategies for increasing water supply and/or reducing demand. California Department of Water Resources (b). California State Water Project Water Supply. Web page accessed 5/21/2015 at http://www.water.ca.gov/swp/watersupply.cfm. EPA. 2010. “California Water Fact Sheet.” EPA WaterSense. EPA832-F-10-016. http://www.epa.gov/watersense/docs/california_state_fact_sheet.pdf. May, John. 2015. “The Status of California’s Current Water Resources.” Blog post in the blog MoGreenStats. http://www.mogreenstats.com. Pacific Institute and the National Resources Defense Council (NRDC). 2014. The Untapped Potential of California’s Water Supply: Efficiency, Reuse, and Stormwater. http://pacinst.org/publication/ca-water-supply-solutions/#issuebriefs. U.S. Global Change Research Program. 2014. Climate Change Impacts in the United States: The Third U.S. National Climate Assessment. http://www.nca2014.globalchange.gov. By mogreenstats in Climate Change, Consumption and Supply, Greenhouse Gas Emissions, Water on 2015/07/09 .